John groans into the microphone towards the end of “Anarcadia: All Horned Animals,” and some people lightly laugh. Before “Sick Mirrors,” John delivers his famous extended Cher speech, which earns him numerous laughs from the audience. “Beware, beware the black shadow of Cher. Beware, beware the black shadow of Cher. She walks this land, she stalks this land. Cher made of antimatter, with real hair. Can I please have these two lights at my feet turned off for this one? Thank you. If possible, otherwise I’ll break them.” He then thanks someone, so they must have turned the lights off. As far as I know, this was the first (and last) performance of the song to implement the backing video – up to this point, no projection would play and purple lights would shine on the band members, creating shadows on the projection screen behind them. 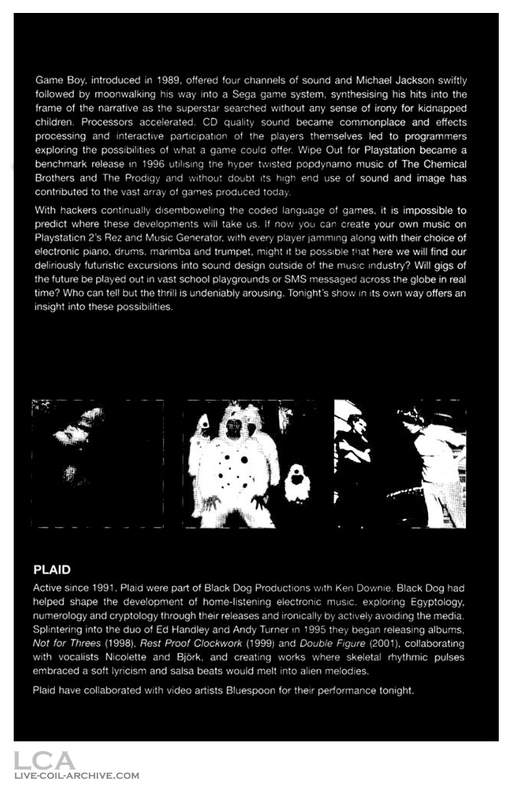 Peter later recycled the backing video projection for various songs and performances, such during “Anarcadia + The Gimp/Sometimes” at Den Haag 2002, “Drip Drop” at Birmingham 2003, and at the beginning and end of all the Black Antlers shows in 2004, making it the most versatile and used of the projections he ever used for live Coil performances. Before “An Unearthly Red,” John says, “Thank you. I’ve neglected to mention [someone’s name I can’t make out] before I came on. I’m very thirsty tonight, sorry.” Someone in the audience yells “I wish I did.” John continues, “The miraculous image of sound washed ashore.” Someone says, “Mister, sorry. Right this way. For you, press (? ).” Perhaps someone had run onstage, or was going where he wasn’t supposed to? John scoffs and says, “Thank you. Heh. 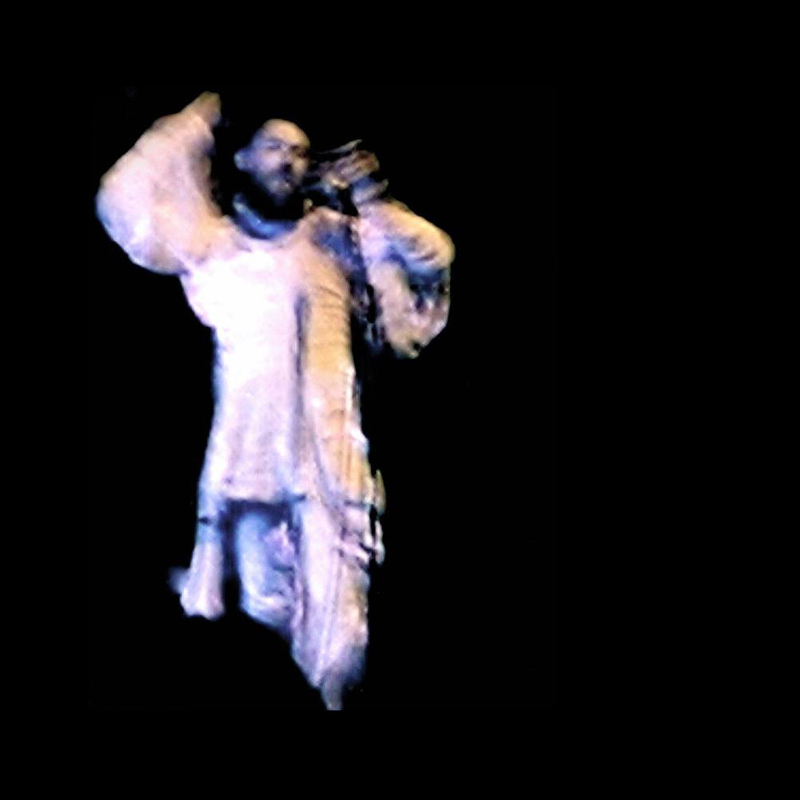 The miraculous image of sound washed ashore.” Someone else in the audience shouts something, and John responds, “Wait, wait, wait, wait.” As the song commences, he says, “Can we have the stage almost completely dark for this one, please, so the video can be seen? This is ‘Captain Clark Welcomes You Aboard Flight 23.’ If it is good enough for Williams Burroughs to fly, then I’m gonna go in it as well.” The nascent lyrics do not refer to George W. Bush whatsoever as they later would; instead, John sings lyrics about multiple kinds of boys: “Game boys / Golden boys / Mushroom boys,” etc. After the song, John finishes, “Thank you very much. That’s it for us this evening. They wouldn’t let us play as we asked, what you wanted, but next time, maybe. 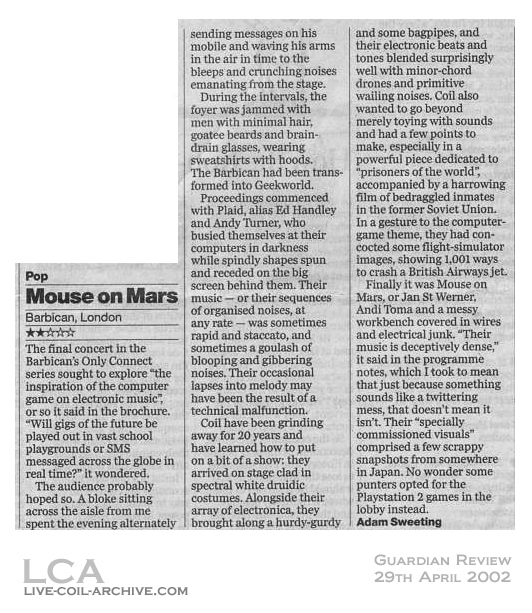 Thanks for coming to see us.” Supposedly, Barbican had strict performance time limitations and Coil were not able to play their usual long set, as they wanted to and normally would. Mike York – Breton bagpipes, bombarde on “Anarcadia: All Horned Animals”. Danny Hyde – credited on the bill for “electronics” (sound mixing). 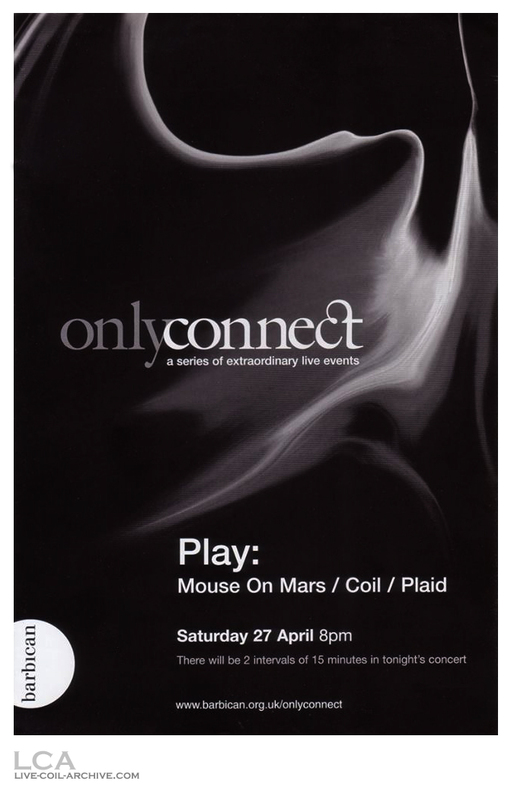 As part of the Barbican’s Only Connect series of shows Coil were invited to take part in the final show devoted to computer games and electronic music. Tonight represented Coil’s third major London appearance, and marked the final date of their European tour. Tonight Coil were missing Thighpaulsandra who was absent due to Spiritualized commitments. The nucleus of John Balance and Peter “Sleazy” Christopherson were as ever aided by Cyclobe’s Simon Norris on keyboards. 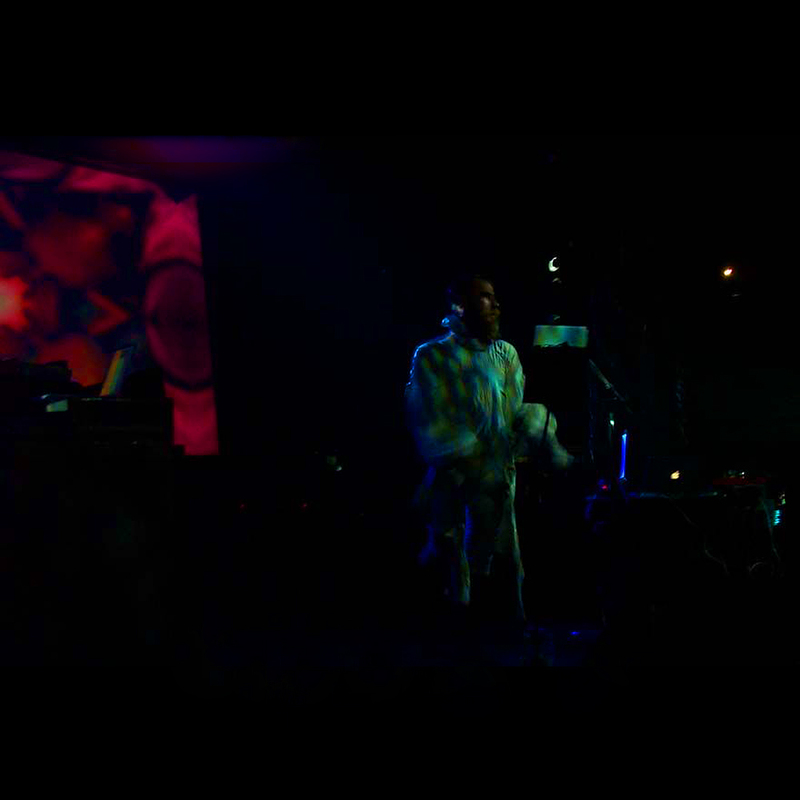 Coil arrived on stage in white druidic costumes shaking horse bells and carrying incense. It appeared like a purification ritual as Balance and Norris treaded the stage hooded, lead by the black clad, bearded and pipe playing Mike York in some form of pagan procession. Cliff Stapleton, the hurdy gurdy man, remained seated at the back. The set opened with ‘Amethyst Deceivers’, backed by tapes, Balance invited the audience to pay respect to the vultures for they are your future. 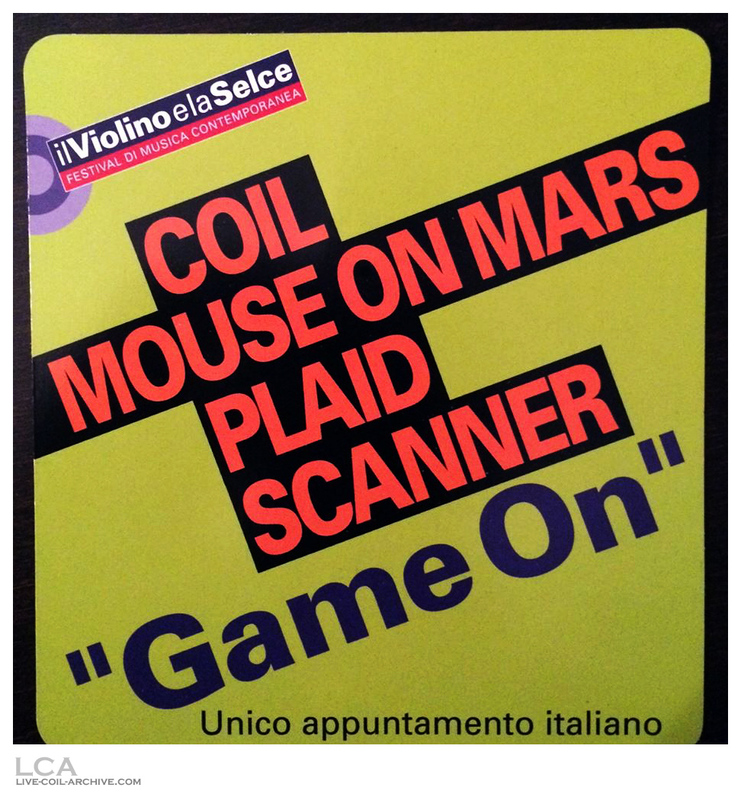 Coil’s slabs of electronic sound were augmented by Breton Pipes and hurdy gurdy. Their stage set was sparse tonight. 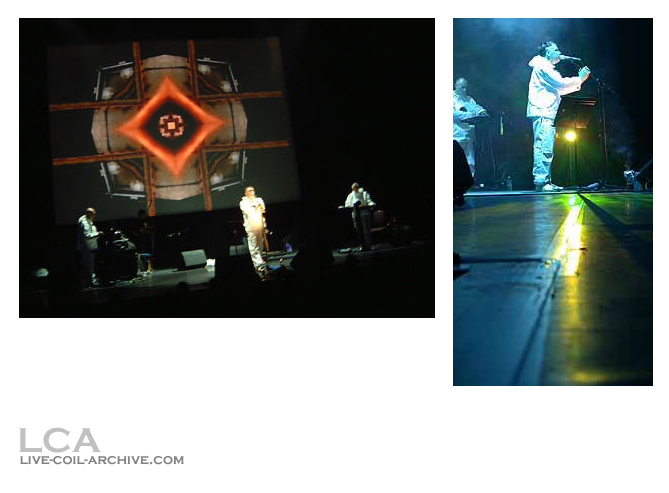 Christopherson stood behind a laptop, controlling the DVD visuals while Simon Norris concentrated on keyboards. If it wasn’t for John Balance’s spirited performance the show may have seemed somewhat limp and static compared to their previous London shows. 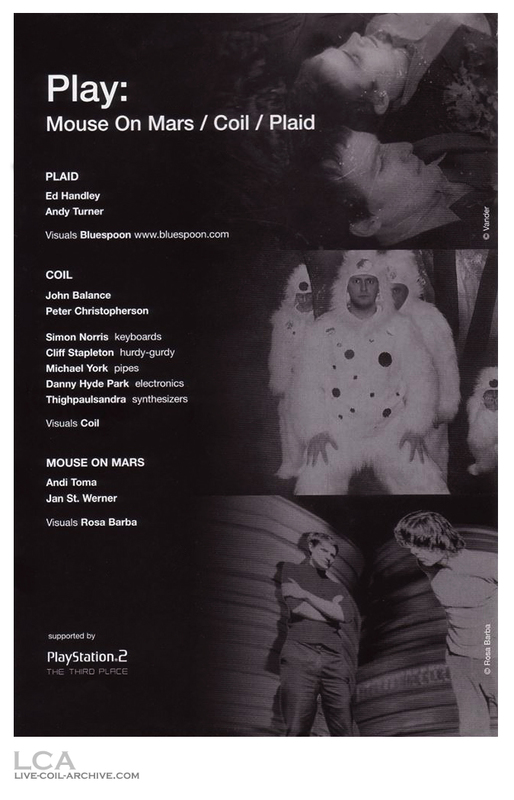 ‘Slur’ was dedicated to Marc Almond and Nicola Bowery, wife of the late performance artist Leigh Bowery. The wailing bagpipes and constant drone of the hurdy gurdy blended surprisingly well with the Coil’s dark electronica of Horse Rotorvator. What I believe to have been ‘Wounded Galaxies Tap at the Window’ followed. This as-of-yet unreleased track is inspired by a quote lifted from their friend William S. Burroughs. Balance continued to bounce, and clap outstretching his arms to the flanks of the stage and skyward. His animated performance at times appeared to resemble some twisted industrial fitness regime was fuelled by “too much amphetamines.” With the stark visuals of ‘A Cold Cell’ Balance’s restlessness proved something of a distraction. The brutal scenes of a youth prison in the former Soviet Union effectively reflected the lyrics. The sight of skinny white kids, abused and dejected, caused a wave of silence throughout the auditorium. Were Coil trying to make a political point? The scenes could have been lifted from an Amnesty International video, although I do feel there was definitely an air of Larry Clark about these visuals. A Cold Cell definitely rated as the highpoint of the night. Balance appeared in good spirits and even delivered some humorous poetry concerning Cher’s hair. With typical perversity Coil’s prelude to their final track paraphrased William Burrough’s Captain Clark would like to welcome you aboard. The lights dimmed and immediately flight simulator visuals appeared on the screen. Game Boy, Space Boy, Mushroom Boys went the lyrics as above on the screen a passenger aircraft flew. And crashed. Over countryside over sea and over cities with skyscrapers. Planes took-off and crashed. The obvious was never made explicit. There was no need. Thankfully this was Coil’s only concession to the theme of the evening. On reflection this was an infuriating and confused affair cut short by the Barbican. Balance himself apologised and claimed they would have played far longer. Over the past two years I’ve witnessed Coil live three times and although the Barbican show failed to reach the dizzying heights of previous London shows Coil’s ability to fuse the mystical past with current technology ensures all Coil performances are remarkable events. Plaid (bottom right, tiny…. )Well, Plaid set the scene well. They lived up to the computer games connection by serving up music that didn’t seem substantial enough to survive as anything worthwhile without their wonderful visuals. The video projection pulses as it tracks around a space filled with cubes stretching off into the distance, some pulsing yellow in time with the zap-gun beeps and beats; iron girders touch across a shimmering backdrop to create spinning clusters of spokes whose rotations smoothly contrast with the chaos about them; a huge human eye looks around as it gets pixelated, mosaiced and otherwise digitally fragmented; a spinning mandala is revealed to be a circle of arcade consoles flicking through classics such as Defender and Donkey Kong; a simple robot arm videos the two Plaid guys as they twiddle knobs, erratically panning about their mixing board and wobbling with the vibrations. Coil quickly burst the bleeping digital bubble. Entering to warped Gyoto-style guttural chants, with bowls of incense, white gowns, circular mirrors fringed with fluff on their chests, a couple of them with white coverings over their heads, brandishing leather straps lined with bells, they seemed even more intensely pagan than usual in contrast to the preceding incessant Electronica. Naturally, squeaks and bass rumbles were in evidence. And their luscious visuals of fungi emphasised the crystalline, almost digital quality of tryptamine hallucinations. 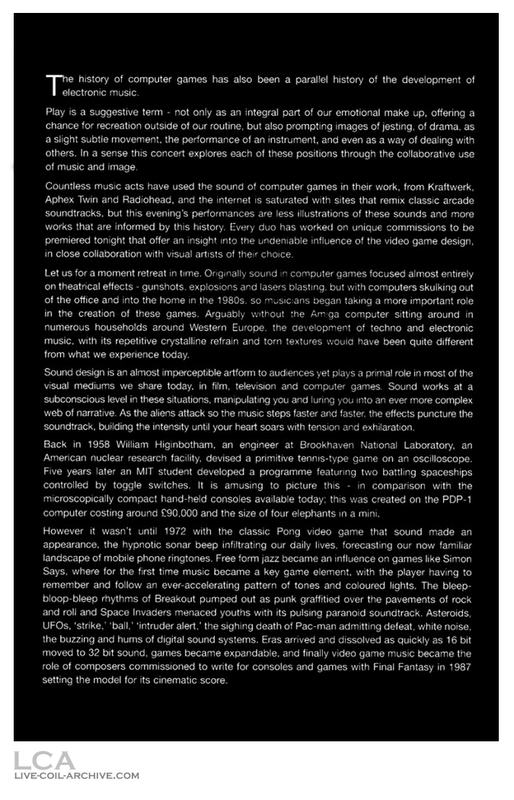 But they weren’t about to perform some commentary on arcade game effects and the abstractions of machinic audio. So most of their set was recent material, performed by Coil, computer games be damned. Which I had no complaints about. A hurdy-gurdy and various pipes – on top of the incense and saturated colours of the light show and visuals – gave them a very organic, often ethnic feel. 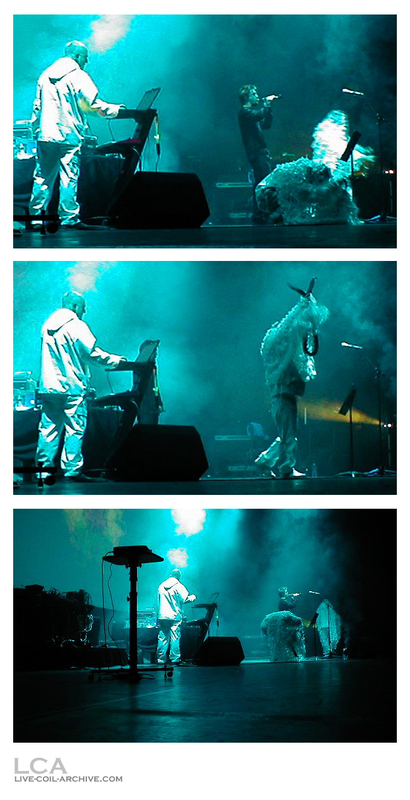 Thinking back to their minimalist performance of Time Machines, it was obvious that they could do ‘digital abstraction’, of sorts – they just didn’t want to. But as Balance asked for the stage lights to go down so the visuals could be clearly seen for the last track, and we were confronted with a flight simulator screen, it was obvious they were going to make some concession to the night’s professed theme. A deep, ominous whumph pulses away. The plane takes off. The cockpit view switches to a view of the plane. It’s a big passenger jet, soaring into digitised clouds. Balance starts wailing over the entrancing noises. It sounds very Arabic to me – maybe the ethnic strains of the bulk of their show adding emphasis. Are Coil trying to say something here? The plane plunges, and just as its nose hit the ground, it freezes, and then it’s back in the sky. A mantric lyric creeps in: “Boys will be boys / Boys will be boys / Mushroom boys / Mushroom boys / Game boys”. Soon the ground the jet’s crashing into has tall blocks of skyscrapers scattered around. The obvious isn’t depicted; it’s never obvious. The obvious lurks. There’s a creative commentary here on hi-tech games and simulation, and lo-tech terrorism and paranoia, that is unstated, oblique, profound and shocking. Mouse On Mars I have to admit I’ve never spent any time with Mouse on Mars, as it were. I was assured they’re worth staying for, so I did. They booted up with some laughably abstract, quiet squiggles and wibbles. Some of the audience applauded with ironic enthusiasm after about a minute of it, and one of the Mice jammed his arms in the air in a mock-rock appreciation posture, which was a small moment of comic genius. Unfortunately, the next 10 minutes did nothing to make me think they would elevate beyond their “specially commissioned” meditations on computer bleepery, and I left with that helpless animated passenger jet arcing across my mind. Well, what a day yesterday was, starting with an afternoon at The Horse Hospital seeing Stapleton and Tibet’s brilliant works of art and hearing their music specially composed for the occasion – I also bought the double CD of it. 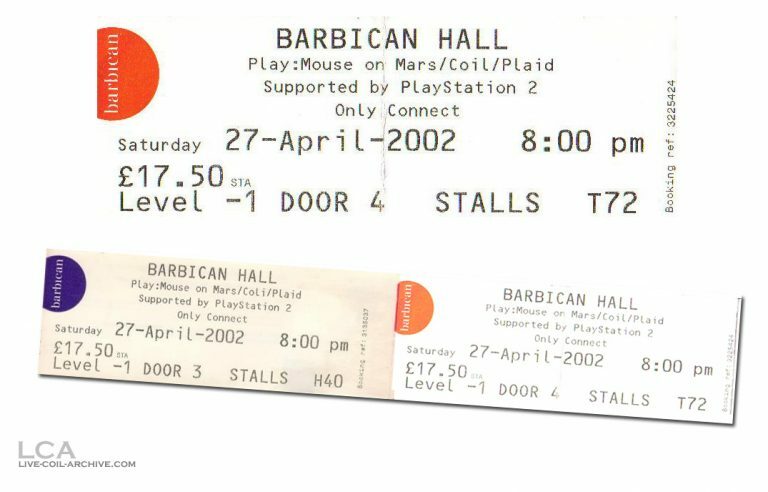 This was followed by an evening at the Barbican 6 rows from the front watching Mouse on Mars (superb rythmic electronics with a really good 3-d animated graphics backdrop) Coil, (about whom more later) and Plaid (pretty good when they got the rythm going, but a lot of, IMHO, pointless electronic noodling in between. Their backdrop of graphics just seemed to be random still images). Incidental music between the acts was provided by Scanner, and was pretty amazing stuff as well. Coil – well, what can I say – I haven’t got a set list and my state of mind was not conducive to good short-term memory ;-). The first few numbers were old ones, and I remember a very good version of Amethyst Deceivers and also a piece of music obviously from the fabled “Wounded Galaxies” non-release. 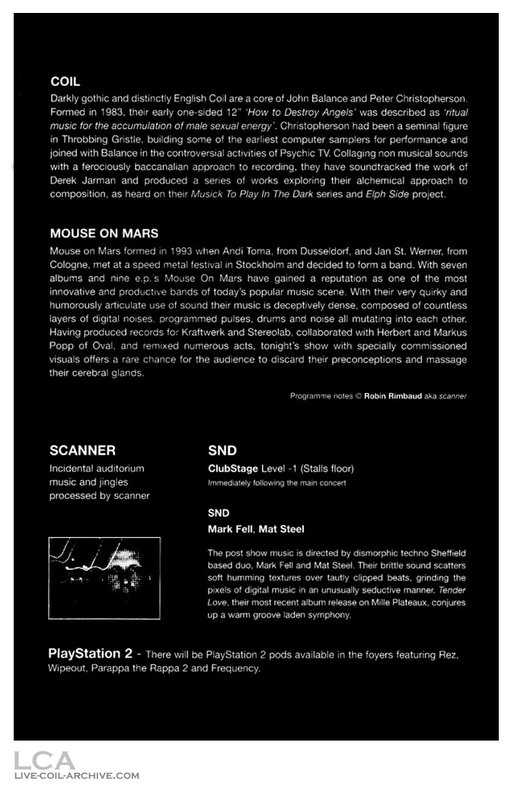 Musically, the instrumental line-up was similar to the Remote Viewer CD, which was on sale still. (I was surprised that a limited edition of 500 for this tour hadn’t already sold out!). Unfortunately I only had enough money to buy a copy for myself. The graphics Coil played to were similar to when I saw them at the second RFH concert – swirly, psychedelic but I didn’t notice any slogans amongst them – perhaps they were all subliminal. At one point, Jhon was about to start a new song when someone from the audience came up to the stage and left something on it, calling out to them that he had done so – I think this made Jhon lose his stride – he had to walk away from the mike and they never re-started that song. Other than that, I thoughht Coil were on very good form. I couldn’t hang about after the concert, so I don’t knoew if Coil “Meeted and Greeted” after the show. If anyone recorded the concert, I’d love to arrange some sort of trade with them – contact me off list. This wonderful day was only spoiled by the fact that there were major power problems with both Underground and Mainline train services which meant that what should have been at the most a one hour journey home took just over three hours. AUD #1a 7-/10 Yes 59 min M?, 256 kbps MP3 Released on the bootleg CD-r Live in London. AUD #1b 7-/10 Yes 59 min M?, FLAC Same recording as AUD #1b, but is lossless, has bits of silence between each track, and there are glitches on “Sick Mirrors” (and a few other places) which indicate disc rot or burn errors. AMT 7/10 No 2 min M1 (? ), Youtube Surfaced in December 2014, from Robin Rimbaud's archives. Clips of “Anarcadia: All Horned Animals,” “A Cold Cell,” and “Sick Mirrors” only, but Rimbaud says the full footage is likely still in his archives somewhere.